Jessica Taylor was born in New Orleans, LA. In 1999, she graduated from Salmen High School in Slidell, LA, and in 2007 from the University of New Orleans with a B.S. in Marketing and Business Administration. She has worked at Hillside since June 2011 and has been our Office Manager since December 2012. She has been married for eleven years to her husband, James, and they have a ten year old son, Owen. Jessica has three pets, a lab mix named Annie and two cats named Bella and Allie. 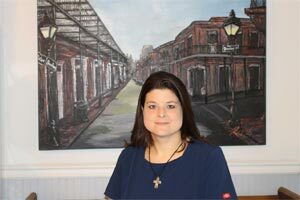 ​Tammy DesOrmeaux was born in Lake Charles, LA. She graduated in 1977 from Saint Louis High School in Lake Charles, LA. She attended Acadiana Technical College in Lake Charles and the University of New Orleans. She moved to Metairie in 1986 and then to Covington in 2003. She has worked at Hillside since January 2008. She enjoys gardening, cooking, art, home decorating, reading, and making jewelry. She also enjoys spending time with her family of rescued cats, five horses, and two Dwarf Nigerian goats. Erin Birdsong is from Bogalusa, La, and graduated from St. Scholastica Academy in 2002. She attended two years of college at Otis College of Arts and Design, studying fashion design. Once she started working with animals in 2016, she found her true calling. Erin has seven cats and one dog at home. Her hobbies mostly consist of spoiling her dog rotten! JoAnna Stewart has been a vet tech for almost 7 years. She started her career with us in 2012. She has a 13 year old son, David, a lab named Duke, and a beagle named Scout. JoAnna Loves her job, her patients, and their owners. She feels truly blessed to work with animals every day!! ​Jordan Murrin was born in Moncton, New Brunswick, Canada, and moved to Louisiana at the age of 11. He graduated from Fontainebleau High School in 2012, and is currently finish his paramedic degree. He enjoys playing with his cat, Jade, and watching the Patriots play on Sunday. Britney Scott graduated from Independence High School and completed some vet tech courses at Northshore Technical College. She has a love of helping canines overcome certain behavioral issues and hopes to study animal behavior one day. In her spare time, she enjoys working with animals, kayaking, and other outdoor activities. Her strong dedication for promoting a happy and healthy well-being for all animals will never end! Erica Banegas has lived in Folsom her entire life. She loves her Dalmatian puppy, Rupert, her Basset Hound, Tristan, and her three cats. She has been a veterinary technicians for 13 years and with Hillside since December 2016. Her favorite hobbies include taking Rupert to play in the creek and going to see the newest Deadpool/Marvel movies. Mercedes Ross is a native of Lee Road but now lives in Covington. She graduated from Varnado High School and attended Delgado Community College. She has 2 young girls, Annabellah and Breelan. Mercedes loves all animals, including her Dalmatian, Oreo, her mutt, Rambo, and her kitty, Kovu. She has been a veterinary technician for 3 years and with Hillside since February 2018. Savannah Lott is from Lee Road and graduated from Fountainebleau High School in 2017. She is currently attending college full-time with the hopes of attaining a business degree. In her spare time, she loves reading and playing sports. She has two dogs, a Boston Terrier named Mugsy and a mix named Reesie.